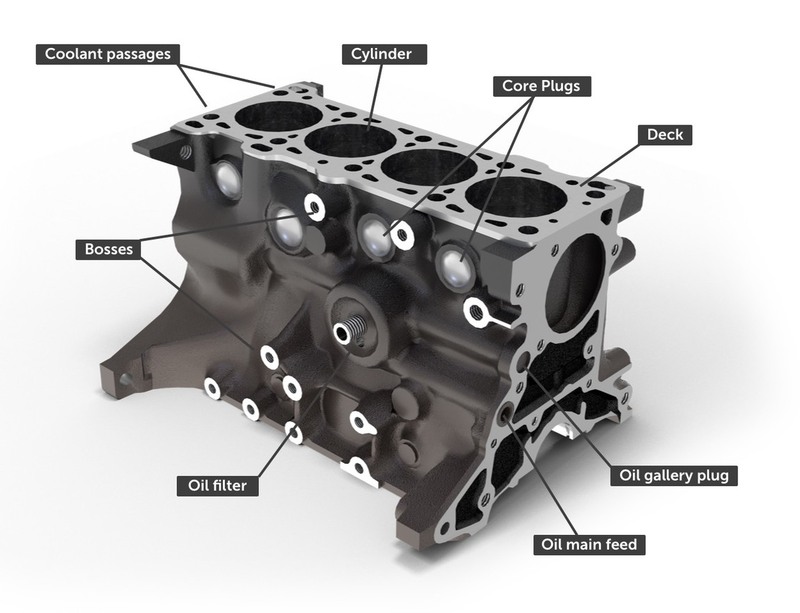 The engine block, also called the cylinder block or just the block, is the biggest and heaviest part of the engine. Strip everything off an engine and this lump of cast metal will be the last thing left. Its main purpose is to house the cylinders in which the pistons run, and it also contains passages through which oil and coolant are pumped. 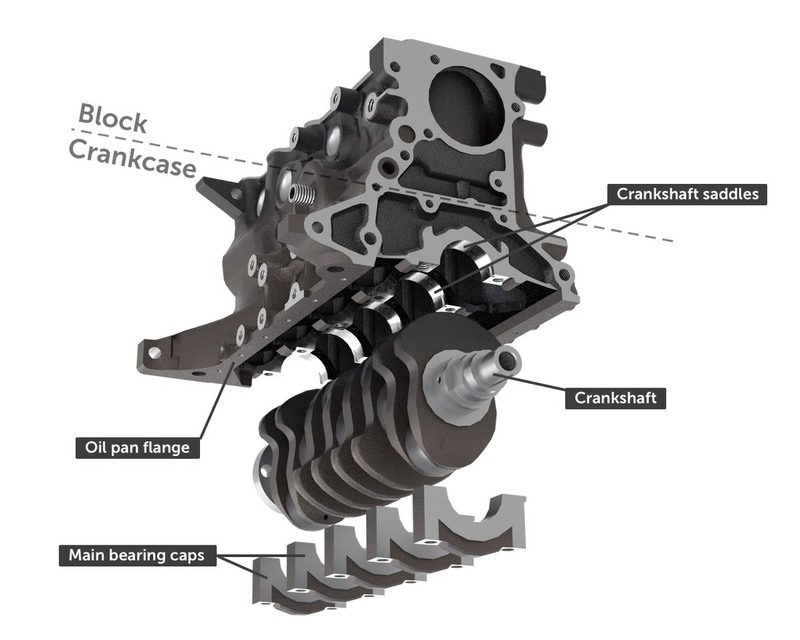 Virtually all modern blocks also form the housing for the crankshaft, an area called the crankcase. Because the block is huge and strong it makes an ideal mounting place for many other parts of the engine - the alternator, water pump, power steering pump and starter motor are all bolted onto the block. Blocks are a one-piece casting of either cast iron or aluminium alloy. Over the past two decades, aluminium alloy has been more frequently used for engine block manufacture due to its light weight. Prior to this, the block was made from cast iron which is far heavier. Cast iron blocks are stronger than aluminium and are still widely used, especially for diesel engines due to the higher compression forces at work. Cylinders are spaces in which the pistons travel. They are large, precisely formed holes which run all the way through the block, with smooth walls to create a seal with the piston. In blocks made from cast iron, the cylinders are usually machined directly into the block, with the walls bored smooth and then finished in a process called honing. Aluminium is softer and more prone to wear, so aluminium alloy blocks will use harder metal cylinder liners or sleeves which are placed into the mould before the molten aluminium is poured or pumped in. Such liners are sometimes also used where a cylinder needs to be repaired or made larger. The cylinder walls may have a special coating to reduce friction and improve heat conductivity. The surface finish of the cylinder walls is vital because friction between the piston and cylinder walls generally accounts for 20% of the friction in an engine.. As the piston moves up and down the cylinder it should ride on a film of oil, avoiding any metal-to-metal contact. So we want smooth walls to avoid friction, but if the walls are too smooth then the oil won’t cling to them. 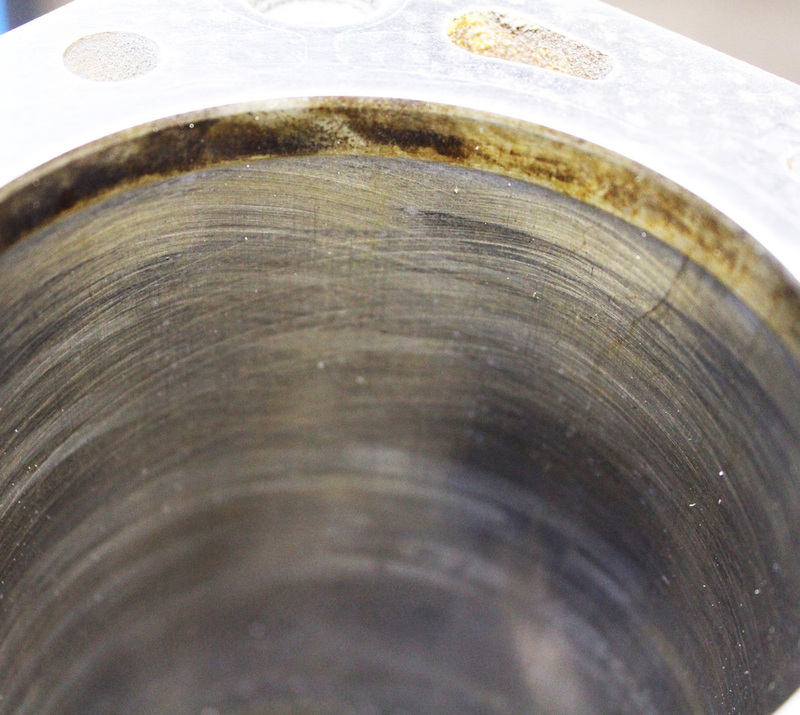 Too rough walls will damage the piston rings at the points where contact is made. A fine cross-hatch pattern is needed, which creates millions of tiny diamond-shaped areas that can act as reservoirs. The size and number of cylinders is the main measure of an engine’s size. More cylinders, and bigger cylinders will give more power. When the engine is running, the cylinder walls get extremely hot - and deliberately so; one of their core functions is to carry heat away from the piston. The cylinders are surrounded by cavities called water jackets through which coolant is pumped by the water pump. Once the engine is up to temperature, this coolant will travel through the radiator where it is cooled. The passages are designed so that the whole system can be completely drained, and to avoid any pockets where air can be trapped and steam could form. The general flow of coolant in an engine is upwards, due to the the fact that hot liquids naturally rise above cold ones. There are two arrangements of flow inside the engine: In a series flow arrangement, the coolant flows across all the cylinders, and then up into the head and back towards the front of the engine. In a parallel flow, the coolant crosses into the head through holes next to each cylinder. The oil passages inside the engine are called galleries. Oil is pumped up from the sump and through the galleries by the oil pump. These passages allow oil to reach the crankshaft, and the cylinder head. In this Mazda engine there are galleries which carry oil to little nozzles which spray the underside of the pistons to keep them cool. Oil galleries are drilled into the block after it has been cast. There will be plugs which are inserted to blank off the ends of galleries after they have been machined. The oil filter and oil pressure sensor will probably be attached to the block. In the illustrated Mazda engine, both are on the block. The top surface of the block, where the cylinder head sits, is called the deck. It is machined perfectly flat and mated to the bottom face of the cylinder head. In between the block and the head there will be a head gasket. On an engine with more than one cylinder head, such as in a V, W or flat layout, there will be a deck where each of the cylinder heads meet the block. The cylinder head is bolted tightly onto the block because the space formed between the walls of the cylinder, the head, and the top of the piston is the combustion chamber and takes the immense force of the detonation of fuel. Because the block is massive and made of cast iron, it rarely warps and so the deck of the block rarely needs to be machined when the engine is rebuilt. This contrasts with the underside of the smaller, more malleable cylinder head which can easily warp. Almost all modern engine blocks have an area at the bottom which houses the crankshaft. This area that surrounds the crankshaft is called the crankcase. The crankshaft sits in saddles, surrounded by bearings and then clamped down with main bearing caps. The opening at the bottom of the crankcase will be sealed by an oil pan, or sump, that holds the engine oil. There may be a gasket between the oil pan and the block or, for this Mazda, the oil pan is sealed with a liquid gasket that is essentially like a silicone sealant. The engine block is used as the mounting point between the engine and the chassis. Brackets called engine mounts are bolted to the engine block and then, through rubber mounts, to the chassis or subframe. Around the outside of the block are holes which have been plugged with metal core plugs, also called freeze plugs or expansion plugs. Despite their name, these plugs are just remnants of the casting process: the mold for the block uses compressed sand to form the spaces such as water jackets inside. When the metal has solidified, this sand is shaken and washed out of the engine through these large holes. Sometimes machining is also done through the holes. A thin metal plug is then pressed into the hole to seal it. If the coolant inside the block freezes, due to insufficient anti-freeze for the outside temperature, then it will expand. In this situation it’s possible that the plugs will pop out before the block cracks, though this is by no means certain and it’s really a minor side-benefit of having the plugs. These core plugs can corrode over the life of the block and may start to leak. They can be removed and replaced. During an engine rebuild the plugs may need to be removed to completely flush the engine. At various points around the block, there are threaded holes with surfaces that are machined flat. These mounting points are called bosses. The block itself is extremely tough. It is unlikely to warp due to its mass, and corrosion on the outside has little effect. It is rare for an engine block to need maintenance over the lifespan of a normal vehicle, faults would normally only be noticed and corrected during a full engine rebuild. Faults with the engine block can be very expensive to resolve, mainly due to the labour cost in stripping down the engine for repair. Cracks can develop in an engine block, either internally or externally. If a crack is suspected, before tearing down the engine, some success might be had with chemical block sealer. These are chemical additives which are added to the coolant and which can seal small breaches in the coolant system. A cast-iron block is checked for cracks by a process called magnafluxing, where a colored metallic fine powder is sprinkled on the block while a current is applied to create a magnetic field. This field is stronger around cracks, and attracts the powder into fine cracks making them easily seen. Aluminium blocks are checked for cracks using a penetrant dye test kit. These work using a colored dye which works its way into cracks and makes them more visible. Once a crack is located, it is possible to weld it up but this is a specialist job because cast materials are tricky to weld without weakening the surrounding area. Close up of a cylinder wall showing the honing pattern. Over time the cylinder walls will build up a glaze of residue due to the heat. 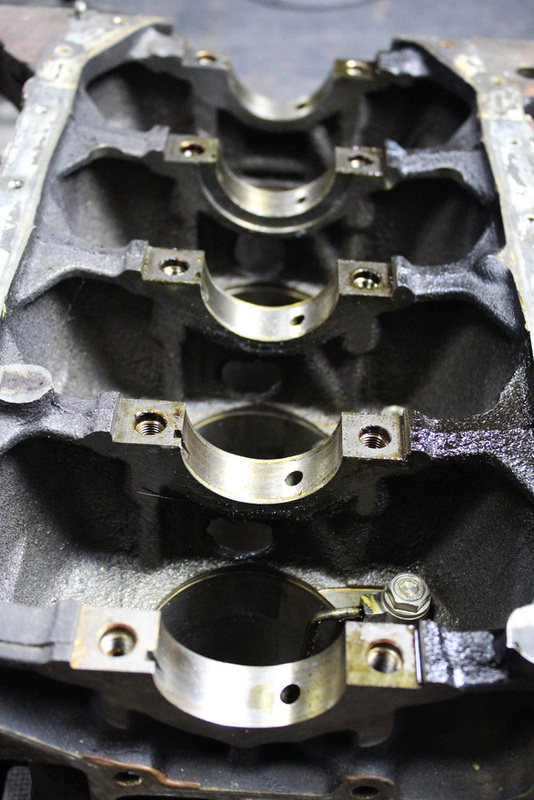 If an engine is rebuilt then the cylinders should be deglazed and inspected. Deglazing can be done by wiping the walls with denatured alcohol or paint thinners, a honing tool can also be used. The cylinders can develop a tapered shape, where the top of the cylinder tapers out from the bottom. This is because the majority of wear occurs where the piston rings contact the cylinder wall. The cylinders can also become out-of-round, or oval shaped. In both cases if this exceeds the manufacturer’s tolerance then the cylinders will need to be machined. Cylinder diameters should be measured with a dial indicator. The crankshaft saddles can become worn or move out of alignment due to warping. This causes the crankshaft to be unevenly clamped. The process of machining to enlarge and align the crankshaft saddles is called line boring. One way to increase the power of an engine is by increasing its capacity, that is, the amount of space for fuel and air above the piston. The volume inside the cylinders can be increased by making them wider, in a process known as engine boring or overboring. A machine shop will bore the cylinders out to increase the diameter, while ensuring that the cylinder runs exactly perpendicular to the crankshaft. Once this is done the engine will need oversized pistons and piston rings to fit the newly sized cylinder. All blocks, with the exception of extremely specialised ones, are cast by pouring molten metal into molds. Historically engines were cast using iron, but increasingly aluminium alloy is used due to its lighter weight. This video shows the process of engine block production. Casting of engine blocks is a mass-production process so specialised blocks, generally one-offs for a custom build, are milled from a single chunk of aluminium. This is known as a billet engine block, after the chunk of solid aluminium. 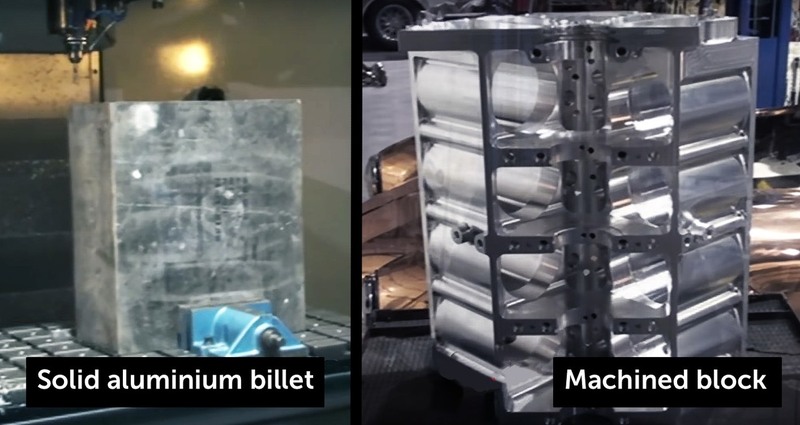 In this video, a 170kg solid block of aluminium is machined into an engine block.